More line is released and you go higher and higher! Even more line is let out and you go REALLY high! 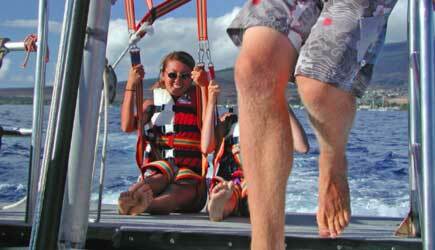 Parasailing is available on Maui from May 16th - Dec. 14th. No parasailing is available during whale season. 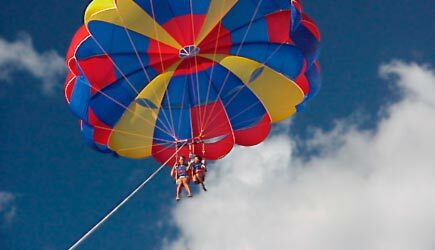 Parasail in paradise … almost anyone can fly … young, old, single or in tandem (or even triple depending on body weights and wind conditions) … it's something for everyone to enjoy and experience. Absolutely no experience is necessary and there is nothing to learn … you just sit back and enjoy the ride. You begin your flight seated on the back deck of the boat … your harness is attached to the parasail, and as the boat begins to accelerate, you feel the vessel sliding out from underneath of you and WHOOOSH … off you go! The length of your flight varies depending on the ride that you select, but ranges from 7 to 14 minutes in the air. At the end of the ride the crew reels you in like a fish, and you land like a feather standing up on the back deck of the boat. Prices are per person, and the per person rate is the same if you fly single or in tandem (or triple) with someone else. Anyone with neck or back injuries, a history of back problems, or pregnant women are not allowed to parasail or to be an observer on the boat. West Maui Parasail now has two locations ... downtown Lahaina from Lahaina Harbor slip #15 AND from Kaanapali Beach under the yellow umbrellas in front of Kaanapali Beach Hotel just north of Whaler's Village Shopping Center (they recommend parking in the KBH parking structure. If you grab drinks or lunch at the Tiki Bar, they may validate your parking.) Their minimum age to parasail is 6, and minimum age to be an observer on the boat is also 6. They restrict observers to one per boat, and do not allow observers during earlybird time slot. Flight time is approximately 10 minutes for the 1200' line and 8 minutes for the 800' line. The minimum weight to fly solo is 130 pounds; the maximum combined weight for tandem flights is 450 pounds. Two discounted timeslots are offered ... if you reserve either the 8am timeslot or the 12pm "high noon" timeslot you will receive the discounted rate posted above the price for the "rest of the day." Note: During fall months, the first time slot is 9am, and the Early Bird rate applies. UFO Parasail operates from Kaanapali Beach in front of Whaler's Village. The minimum age to parasail or observe on the boat is 5. They have no restrictions on the number of observers per boat, even during the early bird time slot! Minimum weight to fly solo is 160 pounds. Maximum combined weight for tandem or triple flights is 450 pounds. (yes, UFO does triple flights if the weights are within range!) Flight time of the 1200 foot line is 10 minutes for single fliers and 12 minutes for tandem / triple flights. Flight time on the 1000 foot line is 8 minutes for single fliers and 10 minutes for tandem/triple flights. 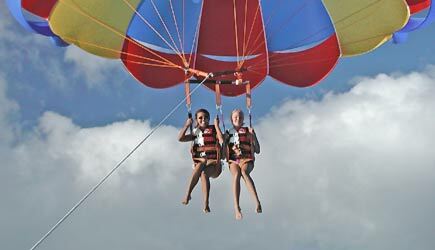 NCL cruise ship passengers in Kahului are able to parasail either day in port. Transportation is not included, and is most economically done by renting a car. We can arrange a rental car with shuttle pick-up at the harbor; rates vary throughout the year but start around $40 per day in low season; see our rental car page for more information. Drive time is approx. 50 minutes for all tours. 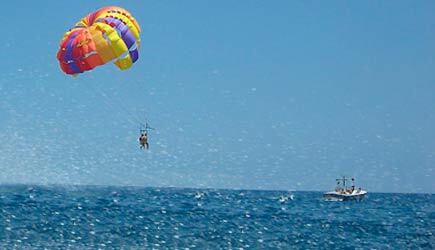 Lahaina cruise ship passengers can parasail and we suggest West Maui Parasailing since they have a location in the same harbor where your tender arrives. What a weird sensation! Imagine yourself sitting on the back deck of a boat. You are wearing a harness ... behind you a parasail is already inflated. The staff clips you onto the line, and you hear the boat's engines power up. You feel the boat sliding out from underneath you ... and moments later the boat has disappeared and you are hovering over the water just a few feet from the surface. 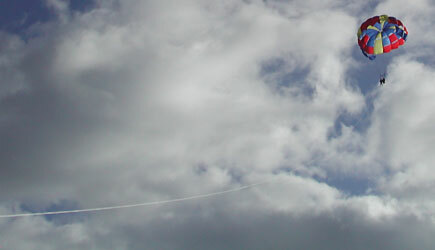 Out goes the line ... and away you go ... a giant kite against the horizon! Parasailing has evolved into a highly safe art form. The take-off and landing both happens on the boat. When your ride concludes, they reel you in like a fish. You land gently on the back deck of the boat where your adventure began. If you want them to, they will add a free-fall effect during your ride. 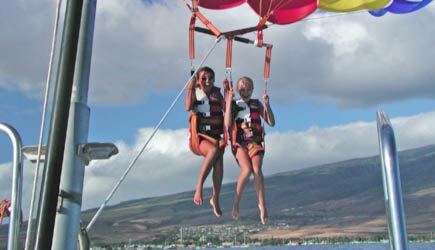 West Maui Parasail will let you fall until your feet hit the water; UFO will stop you just short of the water. Anyone can do it and there is no experience necessary and nothing to learn. Certain weight limits do apply ... see the details above for each tour company's guidelines. But keep in mind these are guidelines, and are subject to change at the captain's discretion based upon wind and ocean conditions. UFO parasailing boats are typically limited to 8 people for everyone's comfort, but groups of up to 12 who want to squeeze in together can be accommodated all at once. West Maui parasailing boats hold 12 people, so larger groups can go together on one boat ... each boat is limited to a maximum of five flights so a party of 12 will need to do tandems and triples in order for everyone to fly during one timeslot on the same boat. 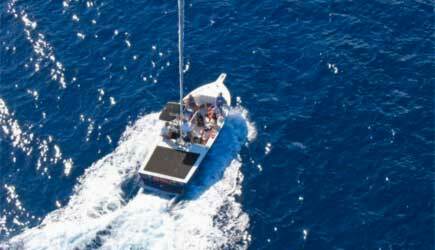 One non-flying observer is allowed per boat at a cost of $32 dollars. Please note that if you are booking for the early bird timeslot or the "high noon" timeslot with the discounted rates, NO observers are allowed. How many parasailing guests will be flying SOLO? **Minimum weight is 130 pounds to fly solo; maximum weight to fly tandem is 450 pounds; weights subject to change due to wind conditions.